Embedded device security is always a concern when building a networked embedded device. Allegro’s RomSTL is a small, resource sensitive TLS client and server solution specifically written for use in embedded systems. RomSTL is standards-based, hardware and software platform agnostic, and written from the ground up for efficient use of Allegro’s FIPS 140-2 cryptography. RomSTL supports the latest RFCs for TLS 1.2 as well as providing support for Suite B crypto algorithms. The full suite of Advanced Edition products support IPv6 and IPv4 operation to meet your embedded device development needs. RomSTL is a small, resource sensitive TLS client and server solution specifically engineered for rigors of embedded computing. Pre-integrated with Allegro’ Secure IoT Suite, RomSTL makes it easy to enable TLS in your embedded designs quickly, easily, while reducing risk. RomSTL supports the latest RFC standards for TLS 1.0, TLS 1.1, and TLS 1.2 secure server and client sessions. The encryption protocols interoperate with any secure browser or server and include RSA, RC4, DES, 3DES, SHA, AES, and Suite B algorithms. Additionally, RomSTL is tightly integrated with RomCert, an embedded implementation of Online Certificate Status Protocol (OCSP) and Simple Certificate Enrollment Protocol (SCEP), that makes embedding security certificate management into resource sensitive embedded systems and consumer electronics fast, easy and reliable, while decreasing time to market. With the included libraries and certificate services, your engineering team can easily build embedded devices that can participate in secure communications. RomSTL is delivered as standard ANSI-C source and built upon a highly portable and field proven abstraction layer enabling it to work with any RTOS or TCP/IP stack. TLS Transport Layer Security) is used to create an authenticated and encrypted channel, often referred to as an encrypted tunnel, between two endpoints on an unsecured network. Open standards define peer negotiation for algorithm selection and public key exchange of secret session keys and X.509 certificates. Originally utilized by OEMS to provide secure communications when performing device management, TLS is now widely used on the Internet to secure all types of transactions and exchange of data. The combination of ubiquitous network communications (wired or wireless) and the sheer growth of low power processor capabilities has created the perfect storm for embedded network enabled devices. Networked embedded systems are pervasive in all types of networks including: medical, energy, safety, smart grid, transportation, consumer, government applications and more. All have their own unique needs to manage and securely transport data over a network. The overwhelming choice for secure transport of data has been and will continue to be TLS. 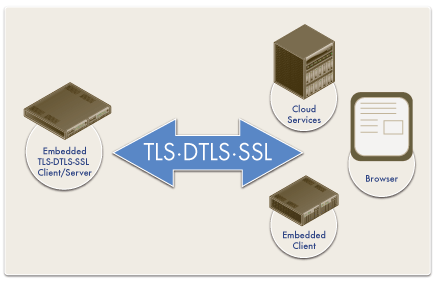 TLS is a modernized version of SSL (Secure Socket Layer). SSL is still used by many systems, but SSL is no longer considered to provide adequate security. The SSL protocol should not be used in new secure systems designs, but RomSTL can be configured to support SSL to interact with legacy systems. DTLS is a variant of TLS which uses UDP connections rather than TCP connections to exchange secure information. Open standards define peer negotiation for algorithm selection and public key exchange of secret session keys and X.509 certificates. For various reasons, the use of DTLS is finding a foothold in consumer based embedded applications. RomSTL supports DTLS client and server sessions as well as TLS client and server sessions.